Located in the Smyrna Market Village, just across from Smyrna City Hall, The Vineyard Wine Market is the city’s finest wine retail, wine bar and wine event space. 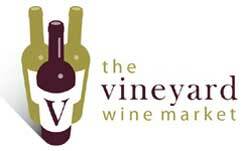 The Vineyard Wine Market is owned and operated by Anthony Alvarez. Whether you are a novice or a connoisseur to the world of wine, you will enjoy wine tastings at The Vineyard. We partner with local restaurants and other business venues to bring the community together in celebration of the grape. Would you like to receive an invitation to the next wine tasting event featuring an array of our hand selected wines? Please sign up for inclusion on our Email mailing list and we will keep you informed of our events. Our menu is coming soon! Please visit again for updates.